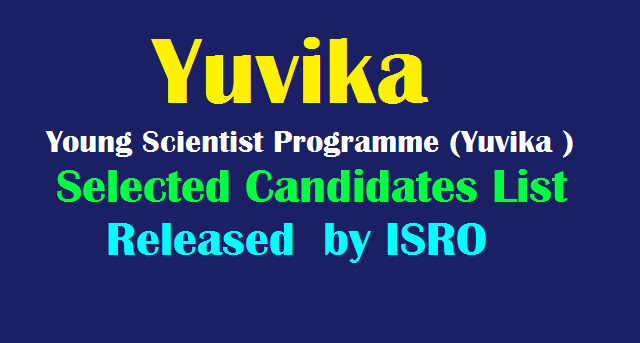 Provisional List of Selected Candidates https://www.isro.gov.in/ Yuvika 2019 provisional list of selected candidates : Yuvika Selected Candidates List 2019 Released Download pdf list Young Scientist Programme (Yuvika ) ISRO Releases List of Provisionally Selected Students for Young Scientist Programme YUVIKA 2019. ISRO had announced the ‘Young Scientist Programme’ or ‘YUva VIgyani KAryakram’ (YUVIKA 2019) for school children earlier this year. ISRO has provided an update on the Young Scientist Programme’ or ‘YUva VIgyani KAryakram’ (YUVIKA 2019) initiative. The Indian Space Research Organisation has released the list of provisionally selected students for the programme . The ‘Young Scientist Programme’ or ‘YUva VIgyani KAryakram’ (YUVIKA 2019) was started to impart basic knowledge on space technology, space science and space applications to young school goers with the intent of arousing their interest in the emerging areas of space activities. Indian Space Research Organisation has launched a special programme for School Children called "Young Scientist Programme" "YUva VIgyani KAryakram" from this year, in tune with the Government's vision "Jai Vigyan, Jai Anusandhan". The Program is primarily aimed at imparting basic knowledge on Space Technology, Space Science and Space Applications to the younger ones with the intent of arousing their interest in the emerging areas of Space activities. The program is thus aimed at creating awareness amongst the youngsters who are the future building blocks of our Nation. ISRO has chalked out this programme to "Catch them young". The programme will be of two weeks duration during summer holidays (second half of May 2019) and the schedule will include invited talks, experience sharing by the eminent scientists, facility and lab visits, exclusive sessions for discussions with experts, practical and feedback sessions. It is proposed to select 3 students each from each State/ Union Territory to participate in this programme covering CBSE, ICSE and State syllabus. As the organisation had committed, 3 students from each State or Union Territory have been selected to participate in this programme based on the applicant’s performance in the 8th Standard, which includes both academic and extracurricular activities. A total of 105 names have been updated in the list on the whole. ISRO mentions on the website that students belonging to the rural area have been given special weightage in the selection criteria. And in cases wherein there is tie between the selected candidates, the younger candidates would be given priority. Students can check if they have been selected for the YUVIKA 2019 programme on the official ISRO website link given here. The provisionally selected candidates will now be requested to send the attested copies of the relevant certificates through e-mail. Furthermore, the final selection list will be announced on 13th April 2019, after verifying the certificates provided by the students, says the Indian Space Research Organisation.